At a time when many Muslims and other minority groups are feeling challenged in the United States, here is a heart-warming story of religious tolerance, respect and acceptance in our university, located in the heartland of America. After losing his IT job in Egypt in 2014, Mohamed Samy felt the need to begin a new life. 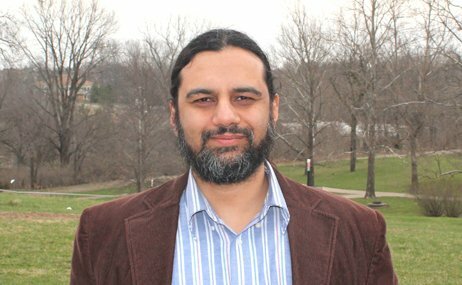 As an experienced software engineer, he knew that coming to the U.S. for a Computer Science master’s degree might provide a valuable education and opportunities to advance his career. 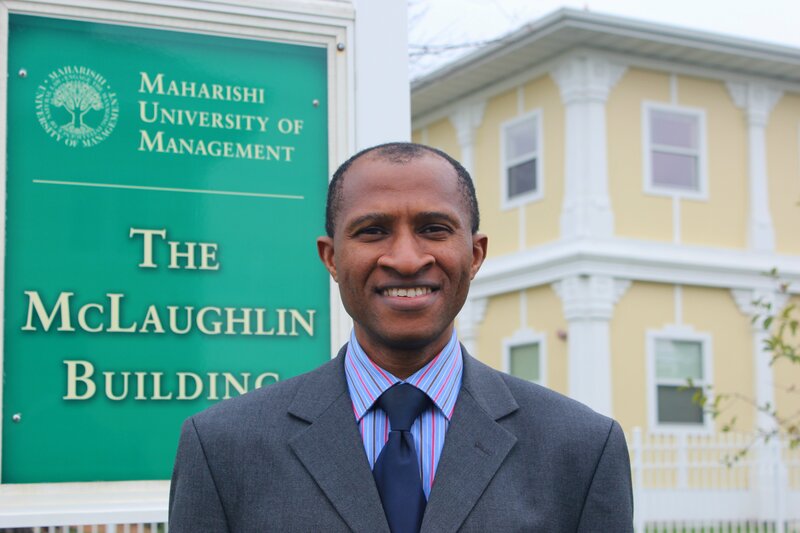 In searching the Internet for a relevant U.S. master’s program, Mohamed found a program that looked perfect for his needs–the Computer Professionals Master’s Program at Maharishi University of Management (not far from Chicago in north central U.S.). In reviewing our website, Mohamed saw that everyone in the University practices a simple, scientific technique to reduce stress and increase creativity and intelligence–the Transcendental Meditation® technique(TM). This seemed unusual and intriguing, so Mohamed did some research and learned that there is a center in Cairo where the TM technique is taught. He attended a free introductory lecture, asked many questions, and learned about the many benefits. He appreciated learning about the compatibility with his Muslim faith, as well as the role of doing TM as part of the MUM curriculum, and decided to take the simple 7-step TM course. Upon learning Transcendental Meditation, Mohamed was pleasantly surprised to experience some personal benefits that he never expected. After losing his job, he had become tense, worried, and could not sleep well for months. Within a few days of beginning TM, Mohamed felt calmer, more relaxed, clearer in his thinking, more optimistic, and was soon able to sleep well again! With appreciation for the benefits of Transcendental Meditation, Mohamed found the Computer Professionals MS Program at MUM to be even more inviting–low initial cost, extensive financial aid, industry orientation, harmonious and diverse campus community, top faculty, and the opportunity to work in a U.S. company for up to two years with a fully-paid curricular practical training (CPT) internship. Mohamed proceeded to apply for our MSCS program. He was accepted and traveled with his wife Natalie Samir to Fairfield, Iowa to enroll with 106 other students from 18 nations in May 2015. 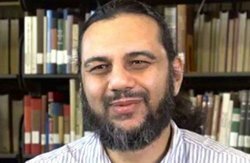 As a seasoned software developer with more than 15 years professional experience, Mohamed didn’t expect to learn much more during his eight months of on-campus classes. To his delight, in every class he learned valuable new computer science knowledge from very competent professors (including one with a PhD from MIT). Mohamed and Natalie felt at home on the beautiful MUM campus in Fairfield, Iowa, where they found people from many diverse cultures and backgrounds all living together in a very warm and welcoming family-like environment. When it came time to apply for internships, they decided to try to find a professional internship right here in Fairfield. With the help of Jim Garrett, Director of Training and Coaching in our Computer Career Center, Mohamed learned of an opportunity to work for a large investment research company in Fairfield. The company had an opening for a high level, experienced Enterprise Architect. The job and location were so ideal, that Mohamed told the company he would even work for less money than he’d already been offered at a different company in another city. To Mohamed’s surprise, the Fairfield company found him to be such an ideal candidate, that they offered him even more money than the other company. Prior to learning the TM technique and coming to MUM, Mohamed was concerned about how comfortable his situation would be with his strong Muslim faith. He quickly realized that there is no contradiction between Transcendental Meditation and Islam. He found that TM is not a religion–there is no worshiping involved. TM is just a technique for experiencing deep rest. There is no concentrating, just experiencing the deepest level of rest. TM has nothing to do with religious practice. Mohamed has found everyone at MUM to be very respectful of his religious practices. Muslim students have access to a small mosque on campus, and they also feel comfortable doing prayers when other students are sometimes nearby. The students enjoyed their Eid celebrations. 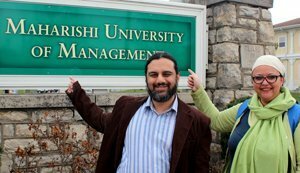 Mohamed is grateful for all the benefits he and Natalie (also practicing TM now) enjoy at Maharishi University of Management. As a way to let others around the world know about TM and MUM, Mohamed has created a special 7-minute video describing his experiences here. Even though Mohamed speaks excellent English, he chose to record the video in Arabic with English sub-titles, so that people throughout the Arabic-speaking world can appreciate what is available to them. The sub-titles make the video easy to appreciate by non-Arabic speakers. Mohamed is happy to share his experiences with other software engineers who may want to know more about our Computer Professionals Program. The “ComPro” Program is now in its 20th year, with nearly 2000 graduates from 78 countries.